Stranglers are carnivorous plants that emit a strong, sweet scent to attract prey. They have an appearance similar to jellyfish, consisting of a bulbous body with many tendrils hanging down. In ancient times, Stranglers were a popular houseplant during the early days of the Elven Empire. This popularity faded with the decadence of that empire, but in recent times it has risen again after Humans started taking notice of the exotic plant. Nowadays, Stranglers are bred in many varieties of colors and sizes and collected as a curiosity. Stranglers are native to the dense jungles of Daen, where records of the plant precede even the Elven Empire. Ruins of both the Meraic and Elven civilization depicted a bulbous plant with moving vines that grasped objects and animals. Elves called the plant Metei Leantan in their tongue, meaning “hungry vines,” for the tendrils resemblance to an arm reaching out when it captures its prey. During the early days of the Elven Empire, the plant was kept as a houseplant used for catching pests as well as providing a fresh aroma. For a period, the popularity of this plant exploded to the point that many Nelfin bred and collected dozens of Stranglers in their homes. As the Empire grew decadent and the Altalar moved away from nature, the Strangler craze fell, and knowledge of proper care was lost or forgotten. For the past thousand years or so, the plant remained an uncommon curiosity left alone in the wild with few botanists ever attempting to grow their own. 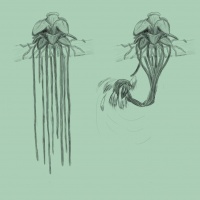 After the colonization of Daendroc by Humans, the plants became known simply as “Stranglers” in Common. Recently, after the subjugation of the Northern Elven Kingdoms by the Regalian Empire, Stranglers have started rising in popularity again. As if to repeat history, the plant's unique traits have made it attractive as a houseplant among Humans, spreading even to the Holy City of Regalia itself. Lost knowledge was found or rediscovered, and modern Strangler breeders have produced far more varieties of the plant in different sizes and colors. Today, it is known as an exotic plant seen in the collection of nobles, apothecaries, and gardeners. Ironically, wild populations are on the decline as the forests of Daen continue to be cut back by Ailor and Orcs for both war and industry. Stranglers are plants that naturally live clinging to trees rather than being rooted in the earth. They are squat plants whose main body can span two to three feet wide and a foot tall. This body consists of a rosette of thick, spear-shaped, leathery leaves that hold reserves of water. From the center grows a large, bulbous flower consisting of five petals. These petals are as thick and tough as the leaves and come in a variety of colors including white, yellow, red, pink, and even a rare bluish violet. The flowers can last many months before wilting and regrowing a couple of months later. The seeds they produce are microscopic and will scatter into the wind after the flower is fertilized. The roots of the plant snake out under the body, as some to cling to its home while others are for capturing prey. The clinging roots are thick and also help absorb moisture from the air while the hunting roots are thin, flexible, and can extend over six feet down below the main body. The hunting roots are somewhat serrated to help pierce the skin of its prey. Stranglers can grow over a dozen of them. Gardeners have been known to keep smaller breeds of Stranglers in specialized pots that let the roots and tendrils hang down. These breeds are only several inches to a foot wide at most, while their roots stretch between three and four feet long. Stranglers are often kept as a curiosity or to catch small pests in one's home. The plant can detect nearby objects and waits for suitable prey to come close enough to be ensnared. The roots will shoot forth in a twisting motion, tightening its grip to strangle the animal and pierce its skin so that they can later absorb the nutrients from its decomposing carcass. Stranglers only need to feed on animals once a month, so owners wanting to catch multiple pests usually remove the animal from the plant's tight grasp to put it back into hunting mode, as well as to get rid of an unwanted decaying mess. Stranglers may also be used as an improvement to air fragrance. A Strangler emits a strong scent from its flower bulb to attract pollinating insects and animal prey. This scent is described as similar to jasmine or milk tea and is quite noticeable up to thirty feet away from the plant. It fades after several months as the flower wilts but returns once the plant blooms again. Individual Stranglers are known to possess different personalities. Some Stranglers are picky eaters that prefer certain animals while ignoring others. Others will attempt to catch anything, even if it's too big to ensnare. A dormant Strangler is a happy Strangler; unless they are capturing prey, movement is usually a sign that something is wrong, whether they are threatened or otherwise feel uncomfortable. Some Stranglers might flail in warning if approached by something they think is a threat. They are capable of recognizing and seem to be aware that they have caretakers so the plants will often act more favorably towards them, being less likely to attack if approached by one. Stranglers and felines are not particularly fond of each other and will often fight when kept together. There are also unconfirmed tales of Stranglers killing people. This page was last edited on 7 August 2018, at 20:40.